The Football League Joomla 1.0 template has been equipped with a how-to video tutorial, showing in detail the key steps for customizing the template’s layout by editing its CSS file. The Daily News Joomla template has been equipped with a how-to video tutorial, displaying all layout customization steps supported by the template. The Space Rocket Joomla 1.5 template is now available for free download from our site and then for quick ‘catapult’ to web space through your Joomla Admin panel. Check out the special video tutorial that comes with the template. Download the brand new High School Joomla 1.5 template by ThemZa! Your school profile page needs it Download now for free. The Mobile Solutions Joomla 1.5 template now has its own video tutorial showing you how to customize its layout step by step. Ready to change the looks of your current online factory for interior&exterior design solutions? 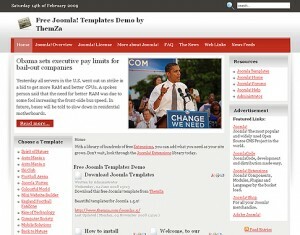 Check out what the Top Architect Joomla 1.5 template has to offer to you! The new upcoming Top Architect Joomla theme will be the right design choice for your online architect studio or e-magazine. The Spa Complex Joomla 1.5 template has been released on the ThemZa site. Download it now for free.